This is an acquired taste. 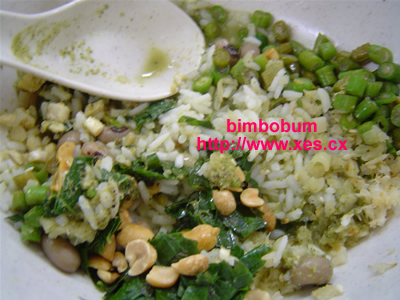 It is a rice dish topped with several types of vegetables (shredded tapioca leaves, radish, leek, diced long beans, etc) and sometimes peanuts, together with a bowl of pounded green tea, basil and mint leaves. The first time I tried it, the ‘tea’ had a strong minty taste, which went well with the rice and vegetables. The other half thought I may not like it, as he anxiously watched me take my first spoonful. Surprisingly, I liked it! Ooh whee! I practically felt healthy for having such a dish that I’m wondering if I’ll lose weight faster if I have this on a daily basis for lunch. Except for the rice, though. You can mix the ingredients together and pour the ‘tea’ in, or sip the tea separately, like how some people prefer. The second time I tried it was at SS2’s Restoran Sun Hin Loong, which is just ok.
3. The Star Online – a recipe! www.xes.cx will be closed till 1st June 2007. The site will not be accessible till then. I depleted my 200 gig bandwidth transfer. While walking down Jalan Alor, I saw one apartment with inflatable toys hanging outside its balcony. The inflatable toys consist of various cartoon characters. An engineer boyfriend can provide you with a secure lifestyle. At 27 years old, an engineer probably has a respectable, stable job that gives him a high income to own a car, invest, have a comfortable life, and get married and buy a house too. Law graduates are still working as a lowly apprentice in law firm, most management graduates have just failed on their first business plan, the arts graduate is still looking for a job, and the medical school graduate is still living in a hospital. An engineer boyfriend will dedicate an unimaginable amount of his time and effort to understand you. Engineers strain really really hard to understand their work. You can believe that they will try really really hard to understand women too, just like how they understand their work, once they believe that you are the one. So even if they don’t understand you initially, they will keep on trying. Even if they still do not understand, they will figure out the correct method to keep you happy ( e.g. buy diamond ring = 1 week’s worth of happiness.) And once they find out the secret formula, they will just keep on repeating it so that the desired results appear. Unlike the Lawyer who will argue with you, the Management graduate who will try to control your spending, the Arts graduate who will ‘change major’, and the medical school graduate who will operate on you. And you know what, it’s really so easy to make engineers believe that you are the ‘one’. Say that you like one of their projects and they will be hooked to you forever. the lawyers will lie about everything, management graduates will cheat your money, the arts graduate will flirt, and you probably just look like another cadaver to the medical school graduate. Your engineer boyfriend is either too busy to have an affair, and even if he does, he is too dumb to lie to you about that. understand and please you, has no time for affairs, and too dumb to lie to you. So girls, why procrastinate? Get an engineer for your boyfriend! OK, WHICH ENGINEER WROTE THIS TESTIMONIAL?? Fellow shuffler Jon aka airviper together with his friends started a Nutrition Club @ Summerfield, behind Changkat Bukit Bintang, Kuala Lumpur. Couple of weeks back, he invited me to his launch and I was told that it comes with free breakfast. Free breakfast? Mmmm, first thing on my mind was continental breakfast buffet with eggs, bacon etc..yummy. Since my office is just around that area, I decided to drop by to give him some support. The Nutrition Club is located outside the compound of Summerfield. Jon and his fellow shareholders rented the place from Summerfield. As I arrived at the place, Jon was no where to be seen but his fellow shareholders were there. One of them invited me in and gave me a brief introduction on what is it about. It’s basically about living healthy, by eating well and so on. Then one angmoh lady came and said, “I lost 8 kgs!”. Food – BBQ – Bread – Cakes – Beer – Sorry all dont have. Then I was told that the drinks are supposed to help me. The said glass of chocolate drink is the main course which gives me the sufficient nutrients to last me for the day. It was quite true, I felt quite full even before finishing the drink! First time in my life, I had liquid breakfast! Jon then came over thanking me for attending the launch. Number of people was seen walking in and out from the premise. Jon was telling me that he ran all over the place inviting people to come over. I admire his determination. During the entire session, many people came. One elderly man, who could hardly walk, even came in to try it! The Nutrition Club is a social club for anyone who is interested in maintaining their health. We provide 3 days FREE Nutritional Breakfast for New Customers. While you are enjoying your breakfast, we will also provide some useful information on how to lead a healthier lifestyle on a daily basis. Moreover, we will also provide a FREE body analysis, (you don’t have to take off your clothes =D ) The analysis will show a person’s body fat, % water in their body, metabolic rate, muscle mass, bone mass, physic rating and even you metabolic age. Full explanation on your body analysis will be provided by our Wellness Coach on the spot. The reason that we set up a nutrition club is because nowadays, due to our modern day lifestyle, many diseases has infected younger Malaysians that 10-20 years ago only affected older people. According to W.H.O. (World Health Organization) 70% of premature deaths are diet related which are caused by Heart Disease, Cancer, Stroke & Diabetes (1# in Malaysia). 50% of these deaths are diet related. 70% of doctors’ visits are due to lack of nutrition. In short, GOOD NUTRITION = PREVENTION. Our objective: Bring Health and Wellness around the World One Person at a Time. P/S This is not a paid ad. When I have nothing better to do, I wonder back to who was at fault. A guy I once knew went around telling his friends that I rejected him so brutally that he cried a million rivers that the cows really couldn’t come home. He had a crush on me. I had a crush on him. He bought me gifts. He spent a lot of time with me daily. I stopped responding to his affection. Played with his feelings by going out with other guys. Refused his daily attention. Occasionally came back to milk his attention when I was bored. Played hard to get. He got heart broken. I was a b*tch. The end. He developed a crush on me. I flirted just a little bit. He bought me a small gift, not even a cute one. I didn’t like it, but I pretended to and said “Thank you” anyway. We chatted on gtalk occasionally. He got obsessed. Started sending me text messages. I was polite and replied a few. After a while, it got tedious. I kept wondering if he really liked me, he would have picked up the damn phone and called me to ask me out. Instead, daily barrage of text messages. Now where was that supposed to lead to? Did he expect me to call him and ask him out? No thank you. He’s the guy, he should do it. He sulked occasionally when I didn’t respond to his text messages. Now why am I supposed to report to him daily about what I had for breakfast, lunch and dinner? Geez. I got tired of waiting. He got boring. He never called me ever. No point of he having my number and not asking me out if he isn’t interested. Is that rejection? He didn’t even make a positive move! Posted on May 22, 2007 April 1, 2009 Author bimbobumCategories bimbobum16 Comments on That is Rejection? I’ve been planning to change the design of this website for some time now. I notice that most of the popular websites have white colour as their background colour. www.xes.cx has been spotting a black background from day one and even from its predecessor’s days. Hence, for the first time, www.xes.cx will be spotting a brand new look. 1. the perfect diamond engagement ring drains your money and energy. 2. the perfect time and place to propose. 3. the perfect place for the wedding reception. 3. the neverending guest list your father, mother, aunts, uncles and grandparents insist that you must include some long-lost cousins from mainland China you’ve never met before. 4. the perfect wedding gown and suit that doesn’t make you look fat. 5. the perfect photographer for wedding photographs, who doesn’t end up cheating your money and giving you tacky captions in your wedding album like, “Love like flowing river, it don’t stop” <--- you know it doesn't sound that right. 6. the perfect place to spend your honeymoon, with enough shopping places for the wife-to-be to spend the last of the husband-to-be's savings. ;D 7. the perfect house for the couple to stay in, most definitely cannot stay with the in-laws for fear of the wife-to-be and husband-to-be's mum chopping each other up with the butcher's knife. 8. the perfect maid because your wife-to-be has told the husband-to-be that she will NOT lift a finger to do the housework. not even to cook dinner. 9. the diamond bracelet and necklace to match the perfect engagement ring, because you're supposed to show her how much you love her ;D 10. the perfect job to feed your wife-to-be's perfect taste in perfection. ;D Did I miss anything out? Lately, there were a bunch of girls playing futsal at our usual futsal place. The girls are around their early 20s, not bad looking and one of them even drives a BMW 5 Series. The girls have their own jerseys, with their names printed at the back of the jerseys. WK got hold of one of the girls’ telephone number through the futsal court’s booking registry. The girl’s name is N. Not bad looking. One day after futsal, KF, Ping, Jin Han, WK and I went yamcha. Since Ping is the only one single on the table, we decided to pass the number to Ping. WK then got hold of Ping’s handphone and started texting N.
“Hi, why didn’t play futsal today? From the Guy Next Court”. Minutes later, N replied, “Who is this ah!”. Then WK replied along the lines “I would like to keep my identity a secret at the moment. Can we be friends first?”. N did not reply… GG Mission Fail! Anyone has better ideas on how to approach a girl through SMS? 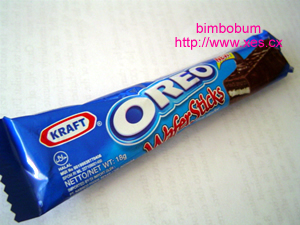 Have you tried the Oreo wafer before? Got this at Giant supermarket at RM0.99.